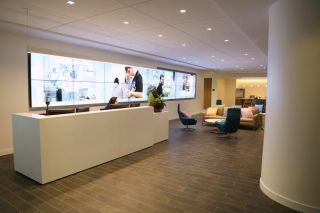 Visitors to Vertex Pharmaceuticals' new corporate headquarters in Cambridge, Massachusetts get an immediate sense of the biotechnology company when they spot the 2x8 videowall, comprised of 55-inch Primeview Ultra Narrow Bezel monitors, in the ninth floor Welcome Center. The videowall's content is supported by a Spyder X20 0808 image processor from Vista Systems. "We wanted to offer an immersive experience for guests that would give a sense of our corporate brand in a short amount of time," says Theron Wallis at Vertex. "A couple of monitors would have been good - an array of 16 would be immersive. So we decided where to position the wall and began laying out the space." Vertex brought on ACT Associates as its AV consultant for the new campus. The videowall was positioned behind reception in the Welcome Center, whose floor also features a training room and conference rooms. The wall is designed to display branding information, company culture, company history, product news and science videos in a changing visual panorama that captures and holds visitors' attention. ACT Associates designed the system around Primeview Eco Line Ultra Narrow displays. "Our videowalls are unique because they are HDBaseT embedded and can carry all connectivity over a singe CAT5 or CAT6 cable. The Vertex videowall is configured with 16 Primeview monitors divided into four 2x2 arrays with a total of 8 inputs. Each 2x2 array comprises one signal. There are seven computer inputs and one digital signage input, the latter via a Visix media player. Four outputs are currently in use, so the system has room to grow. Averbuch recommended Vista Systems' Spyder for image processing. "It's the best and most reliable solution in the industry," he declares. "There are so many options out there, but cheaper solutions typically end up being more expensive in the long run." Peter Thompson of ACT Associates arranged a demo of the Spyder X20 while the Vertex HQ was still in the early stages of construction. marks the first project on which Vista Systems and Primeview have collaborated. Spyder "is very well known and well regarded in the industry," saysThompson. "The product has a great track record for reliability, ease of set up and ease of use. And their customer support is great. The client loved Spyder when we pitched it to them, as well." update it as we see fit. Vista has been very helpful. We're working with the company to see how we can optimize the system and get the most out of it." "It's been very well received," agrees Thompson. "It's one of the better videowalls we've seen in a long time. Vista and Primeview combine for a great solution." "When you all trust each other and respect each other's solutions you get dynamic results," concludes Averbuch.